Students who love telling stories, immersing themselves in movies, and binge-watching television series may find themselves drawn to the film industry. With a master's degree in film, these learners can turn their passions or hobbies into careers as directors, producers, editors, and writers. The U.S. Bureau of Labor Statistics (BLS) projects each of these careers to grow at least as quickly as the average profession. What Else Can I Expect From an Online Master’s in Film Program? In the online master's in motion media design at SCAD, students learn creative and technical skills necessary to work as art directors, 3D animators, and graphics coordinators. Known for attracting the attention of big-name recruiters like Apple, MTV, and Sony Pictures Entertainment, SCAD helps students gain the hands-on experience and professional connections necessary to land the industry job of their dreams. Students can earn their degree through the school's eLearning program or on its campus in Savannah. Students take a minimum of 45 hours of courses, although some incoming students may require an additional selection of courses, bringing their total to 50-70 hours. Coursework explores motion media cinematography and editing, studio business practice, and contemporary art. All graduate students also complete a final project. Savannah College of Art and Design is regionally accredited by the Southern Association of Colleges and Schools Commission on Colleges (SACSCOC). The School of Communication and Arts at Regent University offers a fully online MFA in film-television studies and a fully online MA in film studies. Students earning their MFA online can concentrate in script and screenwriting, while those pursuing their MA online can concentrate in either script and screenwriting or producing. Graduate students can also pursue their degree on the school's campus in Virginia Beach. A Christian worldview informs all of Regent's programs, including its online film degrees. The school's MFA, which serves as a terminal degree, requires 44 credit hours and successful completion of courses like writing the short film, story structure for stage and screen, feature film scriptwriting. The MA requires a minimum of 30 credit hours and completion of courses like lighting and cinematography, the business of film, and a film-television equipment workshop. Students in both degree tracks complete a final project; students earning their master's can also opt to complete a thesis. Regent University is regionally accredited by the Southern Association of Colleges and Schools Commission on Colleges (SACSCOC). Based in vibrant Nashville, Tennessee, Lipscomb University offers an MA and an MFA in film and creative media. Students take courses online, during weeknights, and sometimes on Saturdays. The school's online MA in film and creative media requires 36 hours of coursework, which students typically complete over two years. Courses consider story and structure, cinematic aesthetics, and acting for directors. At the end of their second year, students submit a portfolio. Students earning their MFA can choose from two film concentrations: writer/producer or writer/director. Both tracks require 62 hours of coursework, which students tend to complete over three years of study. Required coursework in both tracks includes transmedia storytelling, TV writing, and a final portfolio. Students in either concentration can choose to spend their final summer in Los Angeles, taking classes and completing an internship. Lipscomb University is regionally accredited by the Southern Association of Colleges and Schools Commission on Colleges (SACSCOC). Located in Tiffin, Ohio, Tiffin University offers a wide selection of fully online graduate degrees, including a handful that explores different subjects within the humanities. The school's master of humanities with a concentration in film studies examines the artistic and historical aspects of film, preparing students to direct, produce, or teach. In addition to courses that explore the creative and generative side of film, this degree also prepares students to teach about the history, significance, and impact of film. Students take courses like classic Hollywood cinema, cult and independent film, and world cinema and documentary film. All courses span a 15-week semester, with start dates in January, May, and August. Part-time students typically earn their degree in two and a half years while full-time students often graduate in only a year and a half. During their studies, students at Tiffin enjoy a variety of support tools like one-on-one peer tutoring, online writing tools, and professional skill-building workshops. Tiffin University is regionally accredited by the Higher Learning Commission (HLC). Tucked into the Rocky Mountains in Gunnison, Colorado, Western State Colorado University caters to students across the country who want to earn a creative degree from afar. The school's graduate creative writing program offers a low-residency MA and MFA in screenwriting for film and television. Students in the program take online courses, participate in video-based class discussions, and consult with their professors through video consultations or by phone. Each summer, creative writing graduate students and faculty from all disciplines and genres gather on the school's campus for the last two weeks in July. Together, they participate in lectures, seminars, and workshops. Students earn their degree over the course of four academic semesters and three summer residencies, completing a total of 60 credit hours of coursework, including 12 dedicated to the thesis. Other courses center on writing feature-length screenplays, creating narratives, and writing TV pilots. Students who wish to add an additional concentration may do so by taking 30 credits of coursework within that secondary area. Western Colorado State University is regionally accredited by the Higher Learning Commission (HLC). As a nonprofit, veteran-founded institution, National University offers more than 100 flexible programs, both online and on its La Jolla campus, to help working professionals and military members advance their careers. Its MA in film studies requires 45 quarter units of coursework, all of which students can complete online. 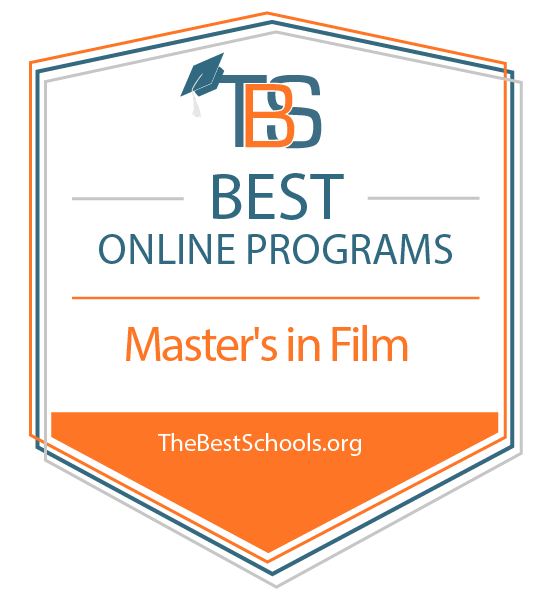 Students earning their online master's degree in film take eight required courses that explore topics like world cinema, the history of silent film, and international directors. Toward the end of their studies, students take a capstone course in which they develop and expand upon a written assignment from one of their earlier film courses. To round out credit requirements, students also complete two elective courses. National University is regionally accredited by the Accrediting Commission for Senior Colleges and Universities of the Western Association of Schools and Colleges (WASC). Students should consider their career path and then seek out film programs that will teach them correlating skills. For example, some film programs focus on narrative, requiring students to complete courses in film history, current trends in cinema, classic theory, and storytelling. Some universities offer creative tracks for students who want to work in specific areas of film such as directing or producing. Other programs offer concentrations in editing and cinematography, allowing students to work with industry-standard programs and equipment. Finally, some schools focus on theoretical aspects of cinema, considering, for instance, the psychology and consumption behind filmmaking (these graduates often go on to earn doctoral degrees). Regardless of which career path students pursue, they will likely need to complete internships or thesis projects. The content offered within online master's in film degrees frequently depends on faculty and current events. In other words, professors may design courses that cover cultural moments and technologies in film so that students can stay up to date. That said, most programs offer some of the following common courses. To make movies and television as believable as possible, writers and directors must conduct plenty of research before film production begins. These courses shows students how to find credible sources and organize their findings. These classes teach students the history of the film industry. Professors may cover the invention of the camera and storytelling trends. Among other fields of study, these interdisciplinary classes combine philosophy, technology, and psychology to understand film. These classes teach degree candidates to craft compelling narratives from the idea stage to final production. To earn an online master's degree in film, a student may have to complete a thesis project. The classes for these projects may span semesters or years. A master's degree in film studies, along with one's interests and expertise, can lead to various career paths: those who love storytelling may become scriptwriters; those who enjoy overseeing projects may become directors or producers; those who are detailed may become editors. These professionals work in offices with the latest film editing technology. They piece together a director's takes to create cohesive stories. Most films require large teams of editors, with each working on a specific piece of the end product. A master's degree sets candidates apart in this competitive field. Both of these careers require professionals to oversee projects from screenplay to final product. Directors and producers often work side by side, with the former managing the creative side and the latter managing the financial side. Master's degrees give graduates the insight and skills they need to oversee such large projects without losing sight of the stories. Before any film or television show can go into production, it needs a compelling script. These professionals create characters, develop stories, and write it down in the widely recognized format for film. While writers do not need diplomas to sell their scripts, master's degrees provide learners with the tools they need to excel.